We all have a story, a testimony. Big or small, decades-long or minutes-long. God has brought us through, He has turned our ashes into beauty, He provided, He stood by. We know the hope we have in God, we know it because we have suffered for it. We have been brought to a place where we needed Him, we have moved out of the darkness by resting against Him, we have unloaded our burdens onto Him. He is the great promise keeper, the shepherd, the rock, the hiding place and we know that because He has brought us in and beckoned us to let Him be that in our lives. But we have friends, family, followers, fans who have never felt that. They only see the pieces of our lives that we chose to share with them. It might look like we have never struggled, it might look like we have come through any adversity on our own accord. It might look like there is no God who is responsible for turning our hot mess into the greatest story of love and faith. Today we want to share a post from Shannon Grochowski of Adventurous Mama. During some of her hardships in life, she found God pursuing her. 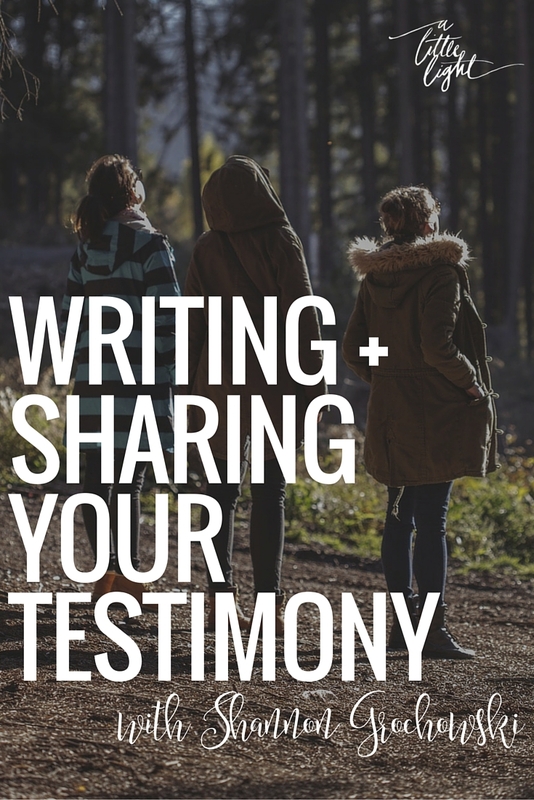 Sharing her the testimonies in her life is something she is passionate about, and something she wants to encourage other women to do. . .
Chains weighed me down. Scales enclosed my eyes. I had the ability of sight but never fully seeing. The ability to walk but I was walking dead without a purpose. My heart pumped life and blood and my lungs filled with air but I was lifeless inside. Wandering this earthly soil looking for the next pleasure to satisfy my hunger for something more than what I was tasting. That was my life prior to being transformed. Before the Lord removed my chains, my scales and breathed purpose into my life and soul. I was made anew. Our King promises us that when we accept the gift of his Son, we are a new creation. No longer a part of the walking dead but alive fully with Christ. Finally living in our full splendor by being in a relationship with Him once again. I believe that God started to write my story before I was conceived. It has not been an easy one and even after I became a Christian it was not as if my life was now magically free of trails. In fact, we are to expect them as we walk our journey, but God promises to always be there to see us through. The past seven years and even more recently this past year has been full of heartache and pain. I walked through my husband’s brother being killed in a car accident at the age of 18. Finding out that my husband (who at the time was only my boyfriend) had been unfaithful to me on numerous occasions. Then last year, of trying to conceive our fourth child which has led me to be a mother of six but yet my home holds three precious ones. Finally, my father passing away unexpectedly. Deep trenches that my legs now seem weary to walk in even on the easiest of days. Has my trust in the Lord faltered? It did, but only for a mere second. I am only human. However my God is good and I know this down to the depth of who I am. He graces us with new mercies every day. Even during the grimmest times in our lives, He is there. This is why I am not ashamed to proclaim His presence in my life. In my weaknesses, I am made strong and the Lord is glorified. “Even though I walk through the valley of the shadow of death, I will fear no evil, for you are with me; your rod and your staff, they comfort me.” Psalm 23:4 For each one of us who have chosen this narrow path, do not be afraid to share your trails along with your victories that He gives you. They are His unique story handwritten not just for you but for those around you. Be encouraged dear sisters that the Lord will always fight for us, we need only be still. We need only to trust. 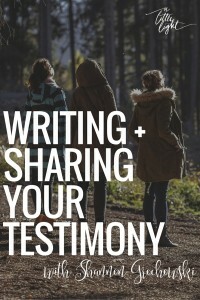 Sharing our story I believe is one of the most beautiful ways we can show Christ. Who can deny us the truth’s in our story? No one. They are ours, and they are beautiful in all the agony and love that is intertwined within. Shannon is a BC mama to three who writes at Adventurous Mama. She is passionate about motherhood, seeking adventure in life and in herself, writing, photography, and has a great series called the #kindnessmovement. Ive had so many good and bad things happen, but all good testimonies. I would also love to start sharing it ob a blog as i know many need to heat the love and message of God.